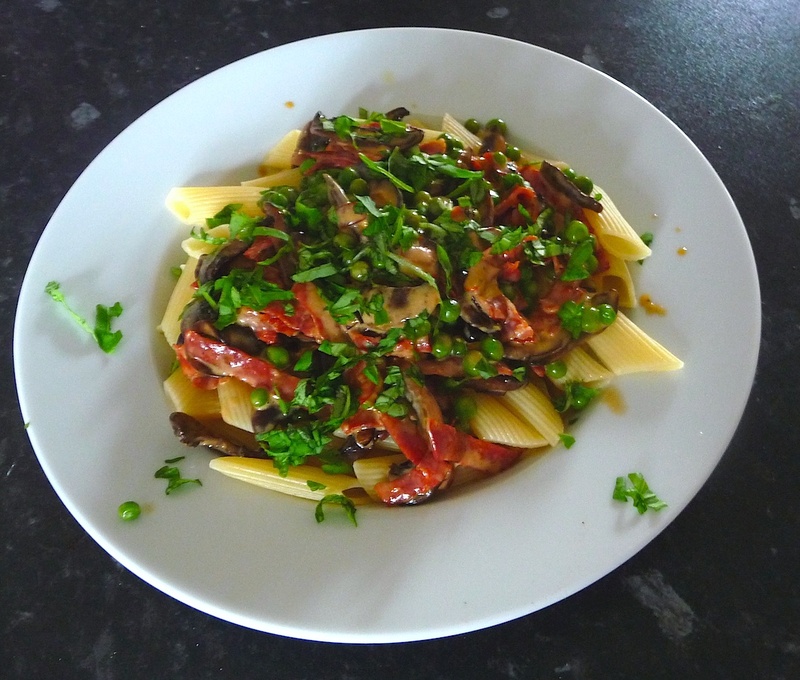 This page is adapted from my post on 26 June 2012, to publish the recipe under ‘Food’. I’ll do the same with other recipes I post in the future. One way I express my creativity is by cooking, leaving the recipe books (and recipe blogs) aside sometimes and cobbling something together with whatever happens to be in the fridge and the store cupboard. I also feel strongly that a lot of vested interests try to mislead us about so-called ‘healthy food’ and frighten us into eating all sorts of products coming out of disgusting industrial processes. What guides me is a very simple phrase used repeatedly by my grandmother: “everything in moderation”. Two days a week I do not eat meat. The other five I do, real meat from my local butcher. I think I eat healthily (having reached well over 7 decades, never in hospital, only ‘sick’ days were a bout of Asian ‘flu and shingles, I can still walk 20 miles without a problem and there’s no power steering on my VW camper). Something else I deplore which is promoted as ‘healthy eating’ nowadays is margarine – a dreadful chemical concoction only a molecule link or two away from plastic. It never enters my home. My staples are olive oil, sunflower oil (margarine without all the chemicals and the large quantities of water) and English or Irish butter (or Welsh), with corn oil for frying fish and chips – you can make it hotter than sunflower. And I deplore the fact it’s now almost impossible to find good sirloin steak (if I could afford it! ); it should look like a piece of marble, with fat everywhere – it’s essential for taste and tenderness. Another excuse for eating pre-prepared junk from the supermarket or fast food outlet is “too busy”. I don’t believe it. Yes, some of the classic recipes take a while to do, but good food can be quick and easy. So, I’m writing this while I throw together this evening’s meal. I reckon it’ll be take about 20 mins tops – split between now and this evening. What did I find in the fridge today? A dozen good-sized mushrooms, a couple of Spring onions (scallions to our USA friends), about a dozen thin slices of Spanish chorizo and half a dozen of Italian pepperoni, half a lemon over from making gin and tonics last night, and half full tubs of double cream and whipping cream over from something. I know there’s half a packet of fresh pasta in the freezer and there’s a basil plant growing on the windowsill. So, I’ve peeled and sliced the mushrooms (couple of mins) while a dollop of olive oil and a knob of butter get really hot in the frying pan (when the butter foam subsides it’s hot enough). If it’s not hot the mushrooms will boil in their own juice rather than saute. When the mushrooms are done (5 mins?) I squeeze over the juice of the half lemon, lower the heat and add the sliced Spring onions; cook for another 2 mins. While that’s happening I stack the chorizo and pepperoni and cut into strips, throw this in the pan. Cook another couple of minutes while mixing then turn it off till when you want to eat – for me about nine hours in the future. The above took well under 15 minutes. Coming up to eating time (we eat around six) I put a big pan of salted water on the hob to boil. When it’s boiling I tipped in the pasta. At a few minutes to 6pm I heated up the pan with mushrooms, added a cup of frozen petit pois and simmered for a couple of minutes, poured in the two creams and stirred till it was hot. Salt and fresh ground black pepper were added to taste. The pasta was drained, tossed it in a little olive oil, divided onto the warmed pasta bowls (there are two of us), spooned on the mushroom concoction and sprinkled with shredded fresh basil leaves. I could have grated over some parmigiano reggiano, which is in the fridge, or added a side salad, though on this occasion I did neither. The longest part of the whole thing was waiting for the pasta water to boil; in fact it took longer to write this than to do the cooking (and as a former journalist I type pretty fast)! It doesn’t even need a sophisticated kitchen – it’d be just as easy in Lofty, my VW camper.